I have a semi-nice printer that I use occasionally (say once every 1-4 weeks), with times where I won't touch it for a while then one day print a bunch of pictures or just documents. The use though is so infrequent that previous inkjet printers have had their ink dry up and become useless. There's not much return on investment there. Is their any way to extend the life of an ink cartridge that's not used often? Please give details if you can. All I can suggest is to print a test page on the weeks you don't use it to keep the nozzles clean. 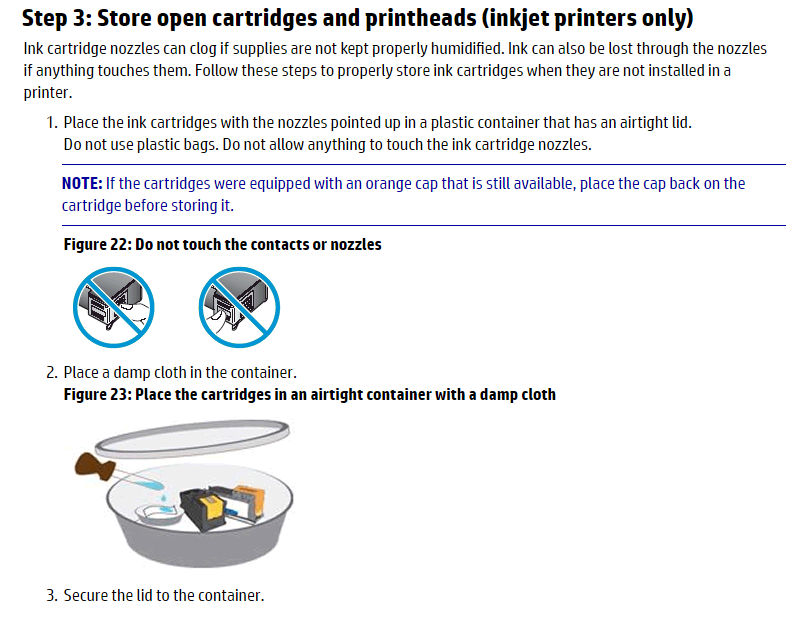 The ink in the cartridge does not dry up, usually the nozzles get clogged with dried ink from non use. Other than that go with a color laser printer. Here is an article from HP on the subject. EDIT HP article is no longer available, but there is an Internet archive of the original. Additionally to Moab's answer, I suggest to not unplug the printer's power cable. Most devices will do a self-test, wasting lots of ink, when the power was interrupted. The cost of the power consumption in stand-by mode, is nothing compared to the cost of the ink that's wasted during avoidable self-tests. I read this some time ago in the German "c't" magazine. Modern inkjets have become better about clogging. It will depend on the model, environment etc, but in general a modern inkjet can happily sit for a week or two without clogging (I also have a rarely-used printer). In principle you could take out the cartridges/print heads when not in use and put them into a vacuum airtight bag/box or similar; that should prevent clogging. However, this is probably much more work than just printing a page every two to three weeks, so this seems the best way to go. You can just set yourself a reminder to print a test page every start of the month or so. No need to even hook up a computer - most printers will print a test page if you hold the "paper feed" button when switching it on (or some similar combination, check manual). Doing this once a month should generally be enough. Light clogging is usually easy to remove by wiping the nozzles with alcohol. I've used that to revive a printer that had sat unused for almost a year. Also see e.g. I have found that Epson inkjet rinters need to be used often, or the heads dry up. They tend to have the best photo print quality. I've had two Epsons. HP inkjet printers do not dry up nearly so easily. I think they produce the best crisp text and graphics. I have an HP DesignJet 450c large format printer, and I have had a couple of BubbleJet desktop models. Canon inkjet printers produce very good text and photo quality, and my general purpose PiXMA iP4500 has never clogged up, even after not having been used for many weeks. Most people really don't need color pictures and would be best served by putting an ax through the one they currently own, then driving a stake through it to remind themselves that $8000 a gallon is way too much to pay for ink. Go out and purchase a good low-end monochrome laser printer. Use the local picture printing kiosk for any color pictures you need. It's cheaper than filling the spent ink tray every time the printer starts up and clears its heads. Basically, if you're stubbornly going to keep going the inkjet route and not use it to print at least ten pages a week, buy one that has the print head built into the cartridge and buy a new set of cartridges every time you intend on printing. Do not buy a printer with separate print heads if you do not intend on using it! The print heads sediment up, and since most people are not buying industrial strength ink printers with replaceable print heads, the only way of fixing it is to throw the printer away, extremely wasteful of money and resources when you find out your multifunction scanner/fax/printer is useless because of this. And don't even begin to consider a color laser printer. The damn things are even worse about wasting toner on doing recalibrates and will send you to the poor house buying toner cartridges for just spinning over doing registry checks. Here is a solution/suggestion based on the type of printing you do. If your needs are "primarily" those of printing text, drawing, and other black & white material, you might get by with an older printer that uses/used ribbons—either the one time film style or the multi-use fabric type. These "older" printer ribbons almost never dry out if stored in cool dry areas. When you need something with colors then fire-up the newer ink monster to handle that project! Having been in the office supply business for many years, I can tell you not all of those printers and ribbons are in land fills! Finding an old printer may pose a problem, but also, locating the ribbons is a worthwhile & money-saving effort! I have found that printing a test page every 3 weeks completely keeps it from happening. I have been doing this for a year and haven't had the ink drying up issue nor have I ran out of ink, because I don't use it often. I know people think they won't remember but I have it scheduled on my google calendar for every 3 weeks so I am reminded. This will save you a ton of money on ink and the frustration of finding out when you need it. I also bought an Epson that allows me to only change the black cartridge when it runs out, which is mainly what I use. Alot of printers require you to buy all the ink cartridges when your black is used up, it's a total waste of money. Not the answer you're looking for? Browse other questions tagged inkjet-printer cartridge printer or ask your own question. Should you switch your Inkjet printer off or leave it on standby for ink cartridges to not dry? What solvent can I use to clean a Canon (LP2000 detachable) print head?